For the Canadian television and film executive, see Catherine Tait. 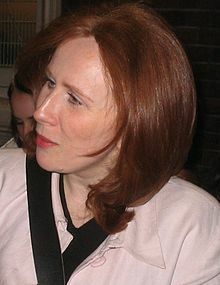 Catherine Tate (born Catherine Ford; 12 May 1968) is an English comedian, actress, and writer. She has won numerous awards for her work on the sketch comedy series The Catherine Tate Show as well as being nominated for an International Emmy Award and seven BAFTA Awards. Following the success of The Catherine Tate Show, Tate played Donna Noble in the 2006 Christmas special of Doctor Who and later reprised her role, becoming the Tenth Doctor's regular companion for the fourth series in 2008. In 2011, she began a recurring role as Nellie Bertram in the U.S. version of The Office and was a regular until the series ended. She now provides the voice of Magica De Spell in the 2017 reboot of Disney's DuckTales animated series. Tate was born Catherine Ford on 12 May 1969 in Bloomsbury, where she was raised in the Brunswick Centre. Her mother, Josephine, was a florist. Tate has said that the character of Margaret in The Catherine Tate Show, who shrieks at the slightest of disturbances, is based largely on her mother. Tate never knew her father as he left very early on in her life and, consequently, she was brought up in a female-dominated environment, being cared for by her mother, grandmother, and godparents. As a child, Tate suffered from obsessive-compulsive disorder (OCD) and was obsessed with word association. For example, she was not able to leave a jumper on the floor because it might have brought misfortune to her mother, whose name began with the letter "J" like "jumper". Tate attended St Joseph's Roman Catholic Primary School in Holborn, and Notre Dame High School, a convent secondary school for girls in Southwark. By the time she was a teenager, she knew she wanted a professional acting career; following the abolition of the sixth form at her secondary school, she was sent to a boys' Roman Catholic school, Salesian College in Battersea, at the age of 16 as it had the necessary facilities for drama. She left school without sitting her A levels. She then tried for four years to get a place in the Central School of Speech and Drama, succeeding on her fourth attempt. She studied there for three years. Prior to getting a place there, Tate went to the Sylvia Young Theatre School, but left after a week, later stating, "Even at that age, I realised I wasn't Bonnie Langford. It was very competitive." She was also a member of the National Youth Theatre. Tate began her television acting career with roles in serial dramas such as The Bill and London's Burning. Tate started stand-up comedy in 1996, and has appeared in comedy series such as The Harry Hill Show, Barking, and That Peter Kay Thing. She played the part of Kate in the unaired pilot episode of sitcom Not Going Out. In 1998, she wrote and starred in Barking, a late night sketch show broadcast on Channel 4 and featuring a host of performers who were later to become celebrated, such as David Walliams, Peter Kay and Mackenzie Crook. Soon after, she became involved with Lee Mack's Perrier Comedy Award-nominated New Bits show at the Edinburgh Film Festival in 2000. In 2001, she returned to the festival with her own sell-out one-woman show, which was followed by roles in Big Train, Attention Scum and TVGoHome. After being spotted at Edinburgh, she was given the role of Angela in the comedy, Wild West, with Dawn French, who commented "Catherine Tate is far too talented and she must be destroyed." Tate has also performed with the Royal Shakespeare Company, and at the National Theatre. She acted the role of Smeraldina in a 2000 RSC production of A Servant to Two Masters, and another role in The Way of the World at the National Theatre. Tate was approached at a post-show party at the Edinburgh Festival by then-BBC controller of comedy Geoffrey Perkins, who encouraged Tate to develop her character ideas, especially to push the boundaries with her teenage character Lauren Cooper. Undertaking Perkins' advice, after a live show Tate found the audience walking out of the show repeating the character's catchphrase Am I bovvered? Produced by Perkins at Tiger Aspect, Tate was given her own programme on BBC Two in 2004, which she co-wrote and starred in with Derren Litten, entitled The Catherine Tate Show, which ran for three series. Two of the show's well-known characters are teenager Lauren Cooper and Joannie "Nan" Taylor, the cockney grandmother. Tate's inspiration for the cockney grandmother came from visits to old people's homes when she was at drama college. 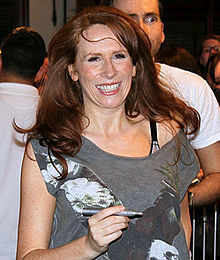 Tate won a British Comedy Award for Best Comedy Newcomer for her work on the first series of The Catherine Tate Show, and with the first series becoming a success, in March 2005, Tate made a guest appearance during the BBC's Comic Relief as the character of Lauren from The Catherine Tate Show, alongside boy-band McFly, which gained her further exposure. In November 2005, Tate appeared in another charity sketch as part of the BBC's annual Children in Need telethon. The segment was a crossover between EastEnders and The Catherine Tate Show, featuring Eastenders characters Peggy Mitchell, Little Mo Mitchell and Stacey Slater, whilst Tate appeared as Lauren. Also at that time, she was a guest star at the 77th Royal Variety Performance and appeared again in the guise of Lauren Cooper. During the sketch, Tate looked up at the Royal Box and asked The Queen, "Is one bovvered? Is one's face bovvered?". During the sketch, co-star Niky Wardley (in character as Liese) remarked: "That old man sitting next to her has fallen asleep." Prince Philip then reportedly complained to the show's executive producer, saying he had been insulted. Tate later won a British Comedy Award for Best British Comedy Actress for her work in the second series of The Catherine Tate Show. At the end of 2005, she appeared in the BBC television adaptation of Bleak House. Tate returned to the stage for the first time since working with the RSC, to play a role in the 2005 West End revival of Some Girl(s), alongside Sara Powell, Lesley Manville, Saffron Burrows and Friends star David Schwimmer. In an interview, Tate commented that she could not look Schwimmer in the eye during her time with him, leading to speculation that the pair did not get on. Tate immediately denied the rumours, explaining that she was joking about her attempts to act "cool" around Schwimmer, whom she described as "a very funny, personable man, and easy to get along with". The third series of The Catherine Tate Show aired in 2006, going on to win the National Television Award for most popular comedy as voted for by the public, and Tate's catchphrase "bovvered", used by her character Lauren Cooper, became so influential in popular culture that it was named Word of the Year and was even poised to enter the Oxford English Dictionary. Tate also played the role of Donna Noble in Doctor Who, a woman in a wedding dress who suddenly appears in the TARDIS at the end of the episode "Doomsday". The following episode, the Christmas special entitled "The Runaway Bride", saw Tate's character in a major role, where she was temporarily the Doctor's companion. On her appearance in the series, Tate commented "I'm honoured and delighted to be joining David Tennant aboard the TARDIS. I was holding out for a summer season at Wigan rep but as a summer job, this'll do." Tate had roles in three films in 2006, these included, Starter for 10, Sixty Six, and Scenes of a Sexual Nature. She later appeared in the films Mrs Ratcliffe's Revolution, in which she played the title character, and Love and Other Disasters. In the 2007 television adaptation of the novel, The Bad Mother's Handbook, she played the lead role and co-starred with Anne Reid. On 16 March 2007, Tate appeared for a second time on Comic Relief as some of her well-known characters from The Catherine Tate Show. She acted in sketches with David Tennant, Daniel Craig, Lenny Henry and the then Prime Minister Tony Blair, who used the show's famous catchphrase, "Am I bovvered?" Tate also appeared as Joannie "Nan" Taylor in an episode of Deal or No Deal, hosted by Noel Edmonds. Tate became a Patron of the performing arts group Theatretrain. Despite speculation that the third series of The Catherine Tate Show would be the last, Tate and the BBC have not ruled out further episodes. She later filmed a one-off special episode which aired on Christmas Day 2007. The episode was subject to criticism when 42 viewers complained about the amount of swearing, and accused Tate of bigotry over the depiction of a family from Northern Ireland as terrorists, whose Christmas presents included a balaclava and a pair of knuckle dusters, in reference to the Troubles. After the complaints were made, an Ofcom report later concluded that the show was not offensive and did not violate broadcasting regulations. An extract from the Ofcom report read "Overall this episode was typical of the Catherine Tate Show and would not have gone beyond the expectations of its usual audience. For those not familiar with the show, the information given at the start was adequate." She has also been nominated for four BAFTA Awards for her work on The Catherine Tate Show to date, including Best Comedy Performance. Tate returned to Doctor Who in 2008 to reprise the role of Donna Noble as the Doctor's companion throughout the fourth series, which was shown on BBC One starting on 5 April for a 13-week run. Producer Russell T Davies said, "We are delighted that one of Britain's greatest talents has agreed to join us for the fourth series." Tate added, "I am delighted to be returning to Doctor Who. I had a blast last Christmas and look forward to travelling again through time and space with that nice man from Gallifrey." At the TV Quick Awards 2008, Tate was voted best actress for her role in Doctor Who. She returned as Donna Noble in the two-part Doctor Who Christmas special The End of Time which was broadcast over Christmas 2009. In 2008 Tate starred as Michelle, a promiscuous mathematics teacher, in David Eldridge's Under The Blue Sky at the Duke of York's Theatre, London, alongside Francesca Annis and Nigel Lindsay. Tate injured her ankle in rehearsal on 15 July. She performed preview shows with the aid of a crutch. On 11 April 2009, 26 December 2009 and 30 January 2010, Tate and David Tennant guest hosted Jonathan Ross' BBC Radio 2 show. In 2009 she created a one off special spin off to The Catherine Tate Show. Although this time the show only starred 'Nan'. In the show, Nan played Scrooge, and was visited by 3 ghosts, one of whom was played by David Tennant. The show was a one off Christmas special however was followed by three other episodes in 2014 and 2015 which are known collectively as Catherine Tate's Nan. In 2010, Tate took part in Channel 4's Comedy Gala, a benefit show held in aid of Great Ormond Street Children's Hospital, filmed live at the O2 Arena in London on 30 March. Tate appeared alongside former co-star David Tennant in the Shakespeare comedy Much Ado About Nothing at London's Wyndham's Theatre from 16 May to September 2011. For her performance – as Beatrice – Catherine won the BroadwayWorld UK Award for Best Leading Actress in a Play. In the seventh-season finale of The Office, which aired on 19 May 2011, Tate guest starred as Nellie Bertram, a potential replacement for the departing Michael Scott (played by Steve Carell). On Saturday 17 December 2011, Tate presented the second episode of Channel 4's Laughing at the... series – entitled "Catherine Tate: Laughing at the Noughties" – in which she met Alan Carr, David Walliams, Noel Fielding, Rob Brydon and (her Doctor Who co-star) David Tennant to discuss the comedy highlights of the 2000s. In January 2012, Tate returned to The Office for its eighth season. She reprised her role as Nellie, who was hired as a "misguided special projects manager". She returned as Nellie for the ninth and final season. She starred alongside David Walliams and Philip Glenister in BBC One's situation comedy Big School in 2013. In November 2014 she was a guest on BBC One's The Graham Norton Show in which she revealed that her first stage appearance had been performing an impression of Gary Glitter in her school nativity play. For Comic Relief 2015, Tate appeared as a nun in a sketch alongside with David Walliams as Lou Todd and Stephen Hawking in the Andy Pipkin role. Three further episodes of Catherine Tate's Nan aired in January 2014 and December 2015 on BBC One after Nan's Christmas Carol which aired on Christmas Day 2009. In January 2016, Tate played the role of Sapphire in the one-off comedy show Billionaire Boy, written by David Walliams. She appeared in Bruce's Hall of Fame with Alexander Armstrong the following day. In 2016, Tate appeared in the new musical comedy Miss Atomic Bomb at the St. James Theatre. The show ran from 7 March to 9 April. It received poor reviews, including a one star review from The Stage. In late 2016, Tate began touring British theatres in The Catherine Tate Show Live, guest-starring Mathew Horne, Niky Wardley and Brett Goldstein. Tate's characters Nan, Nurse Bernie, Geordie Georgie, Sam and Paul and Lauren all featured in the show, linked by videos starring Nick Grimshaw and other celebrities interacting with the characters. In late 2017, Tate was revealed to be part of the cast of Disney's DuckTales reboot, providing the voice of the villainous sorceress Magica De Spell following the death of the character's longtime voice actor, June Foray, in July of the same year. Coincidentally, her Doctor Who co-star, David Tennant, provides the voice of the show's protagonist, Scrooge McDuck. Tate's former partner is stage manager Twig Clark. They have a daughter named Erin, who was born at London's Chelsea and Westminster Hospital in January 2003 and was delivered following an emergency caesarean section. Tate is the patron for the Laura Crane Youth Cancer Trust, supporting the charity since August 2006. In 2011 she took part in the charity's 2011 Charity Calendar. Tate suffered from post-natal depression, from which she only recovered after the filming of the second series of The Catherine Tate Show. She also suffers from occasional panic attacks. Regarding her personal outlook, Tate has said, "I'm an incredibly negative person, so any form of success is only ever going to be a relief to me and set my default position back to neutral." ^ a b "Tate to be Doctor's companion". BBC News, 3 July 2007. Retrieved 4 July 2007. ^ Ng, Philiana (1 June 2012). "The Office Promotes Catherine Tate to Series Regular". TV Guide. Retrieved 4 June 2012. ^ Maxwell, Dominic (29 November 2010). "Catherine Tate, quite a character". The Times. ISSN 0140-0460. Retrieved 19 June 2018. ^ Greenstreet, Rosanna (29 April 2006). "Q&A". the Guardian. Retrieved 19 June 2018. ^ Gibson, Owen (23 December 2005). "The Guardian profile: Catherine Tate". the Guardian. Retrieved 19 June 2018. ^ a b c d e f g Sawyer, Miranda. "Catherine the Great". The Guardian, 15 October 2006. Retrieved 4 July 2007. ^ a b c d e f g h i Viner, Brian (23 December 2006). "Catherine Tate: The shy star". The Independent. London. Retrieved 21 August 2017. ^ a b c d e f "I'm a lazy control freak". The Guardian, 12 July 2005. Retrieved 19 July 2007. ^ a b c d e f "Catherine Tate: Multiple personality"[permanent dead link]. The Independent, 23 March 2004. Retrieved 3 January 2008. ^ Bouquet, Tim (2 September 2016). "Fame Academy: Where Daniel Craig, Helen Mirren and Colin Firth learned to act". The Telegraph. ISSN 0307-1235. Retrieved 13 February 2018. ^ a b c Gibson, Owen. "The Guardian profile: Catherine Tate". The Guardian, 23 December 2005. Retrieved 18 July 2007. ^ a b c d e "Catherine Tate profile". bbc.co.uk. Retrieved 26 May 2007. ^ "Lee Mack Interview – Not Going Out – British Comedy Guide". comedy.org.uk. Retrieved 12 May 2009. ^ Calvi, Nuala. "Tate to talk about her relationship with Shakespeare". The Stage, 16 May 2007. Retrieved 9 April 2008. ^ "Geoffrey Perkins". Comedy Connections. 8 November 2008. BBC 2. ^ "Triple triumph for Little Britain". BBC News, 22 December 2004. Retrieved 7 April 2008. ^ "Catherine Tate appears in Walford". BBC News. Retrieved 18 February 2007. ^ "Tate asks if Queen is 'bovvered'". BBC News, 22 November 2005. Retrieved 28 December 2006. ^ "Merchant takes top comedy honour". BBC News, 14 December 2006. Retrieved 7 April 2008. ^ "Bleak House – on BBC ONE from Thursday 27 October 2005 at 8.00pm". BBC, 4 October 2005. Retrieved 8 April 2008. ^ a b c d Thorpe, Vanessa. "Proletarian utopia? Am I bovvered?". The Guardian, 24 September 2006. Retrieved 7 April 2008. ^ "Friends star makes West End debut". BBC News, 24 May 2005. Retrieved 4 July 2007. ^ Kilkelly, Daniel. "Catherine Tate denies Schwimmer feud". Digital Spy, 25 June 2005. Retrieved 15 August 2007. ^ "National Television Awards 2007". The Guardian. Retrieved 1 November 2007. ^ Phillips, Sarah. "'Bovvered' wins Word of the Year award". The Guardian, 12 October 2006. Retrieved 1 October 2007. ^ a b Catherine Tate to star in Doctor Who Christmas Special. BBC, 9 July 2006. Retrieved 7 April 2008. ^ "Tate to guest star in Doctor Who". BBC News, 9 July 2006. Retrieved 14 June 2006. ^ "Love And Other Disasters". The Guardian. Retrieved 7 April 2008. ^ Oatts, Joanne. "'Bad Mother' Tate pulls in 5.7 million". Digital Spy, 20 February 2007. Retrieved 3 January 2008. ^ "Catherine Tate hails Blair's comic skills". The Daily Telegraph, 23 March 2007. Retrieved 4 June 2007. ^ "Catherine Tate DVD 'sets record'". BBC News, 20 March 2007. Retrieved 4 June 2007. ^ "Theatretrain Patrons - Theatretrain". theatretrain.co.uk. Archived from the original on 21 July 2015. Retrieved 2 August 2015. ^ "Catherine Tate takes foul-mouthed Nan back in time". Mail on Sunday, 6 July 2007. Retrieved 8 July 2007. ^ Martin, Nicole. "Ofcom to investigate Catherine Tate 'bigotry'". The Daily Telegraph, 29 December 2007. Retrieved 4 January 2008. ^ O'Shea, Katherine. "BBC cleared over 'offensive' Catherine Tate". The Daily Telegraph, 14 April 2008. Retrieved 8 May 2008. ^ "Tate festive show 'not offensive'". BBC News, 14 April 2008. Retrieved 8 May 2008. ^ Plunkett, John. "Ofcom not bovvered by Tate swearing". The Guardian, 14 April 2008. Retrieved 8 May 2008. ^ "High ratings for Catherine Tate". BBC News, 27 October 2006. Retrieved 26 May 2007. ^ "Donna says "I do!"". BBC News, 3 July 2007. Retrieved 4 July 2007. ^ "Dr Who is voted No1 … again". The Scotsman, 9 September 2008. Retrieved 9 September 2008. ^ David Tennant, Catherine Tate (guest hosts) (11 April 2009). "Jonathan Ross". Jonathan Ross. London. BBC Radio 2. ^ Miloudi, Sarah (14 April 2009). "Catherine Tate spotted filming Doctor Who in Swansea sun". Western Mail. Archived from the original on 15 April 2009. Retrieved 16 April 2009. ^ "David Tennant and Catherine Tate reunite in West End". BBC News. 8 January 2011. Retrieved 8 January 2011. ^ 2011 BWW UK Award Winners Announced! ROCK OF AGES, GHOST, WIZARD and PHANTOM All Win!. Broadwayworld.com (5 December 2011). Retrieved 14 May 2012. ^ Ng, Philiana (5 April 2011). "Trio Tapped for 'The Office' Season Finale". The Hollywood Reporter. Retrieved 12 April 2011. ^ Kaling, Mindy. "Catherine Tate in The Office". Retrieved 12 April 2011. ^ Laughing at the... – Series 1 – Episode 2 – Catherine Tate: Laughing at the Noughties. Channel 4 (17 December 2011). Retrieved 14 May 2012. ^ Ng, Philiana (1 June 2012). "Catherine Tate Set to Return to 'The Office' as Series Regular". The Hollywood Reporter. Retrieved 4 June 2012. ^ "BBC - Big School - interview with Catherine Tate - Media Centre". bbc.co.uk. Retrieved 2 August 2015. ^ "BBC One - The Graham Norton Show, Series 16, Episode 7". BBC. Retrieved 2 August 2015. ^ Walker, Danny (13 March 2015). "Comic Relief 2015: Watch Stephen Hawking TRANSFORM into super-sized robot and blast Catherine Tate's nun". Mirror. Retrieved 31 March 2015. ^ Day, Elizabeth (3 January 2016). "The week in TV: Gareth Malone's Great Choir Reunion; Billionaire Boy; Charlie Brooker's 2015 Wipe; The Man in the High Castle". the Guardian. Retrieved 13 February 2018. ^ "Miss Atomic Bomb: Catherine Tate is absurdly over the top". Independent.co.uk. Retrieved 18 July 2018. ^ "Catherine Tate musical 'bombs'". Bbc.co.uk. 15 March 2016. Retrieved 18 July 2018. ^ "Catherine Tate is touring the UK later this year". Digitalspy.com. 27 April 2016. Retrieved 18 July 2018. ^ "Did divine intervention make Adrian Chiles and comedienne Catherine Tate an item? - Daily Mail Online". Mail Online. Retrieved 2 August 2015. ^ "Youth Cancer - Laura Crane Youth Cancer Trust". Lauracranetrust.org. Retrieved 18 July 2018. ^ "Doctor Who big winner at TV awards". The Press Association, 8 September 2008. Retrieved 9 September 2008. ^ "ITV admits comedy award deception". BBC News, 8 May 2008. Retrieved 8 May 2008. ^ "ITV rigged comedy award phone vote because Robbie Williams wanted Ant and Dec to win". The Daily Mail, 8 May 2008. Retrieved 8 May 2008. ^ Salem, Rob. "British sketch comedy's Catherine the great". Toronto Star, 19 January 2008. Retrieved 9 April 2008. ^ Lee, Cara (19 March 2009). "Tates Hollywood role". The Sun. London. ^ "A Quiet Word With Catherine Tate". Official website. Australian Broadcasting Corporation. Retrieved 1 August 2011. ^ "Laughing at the..." Official website. Channel Four Television Corporation. Retrieved 13 December 2011. ^ Dave McNary (22 April 2015). "Documentary 'Unity' Set for Aug. 12 Release with 100 Star Narrators". Variety. Retrieved 1 May 2015.